Golden Saloon Holographic Projection Redemption Machine is a virtual reality coin pusher for 4 players ticket redemption game machine, features with holographic projection on each side shows individual game play to each player and is a realistic physics simulate interactions of a real pusher, game graphics show in the pyramid molding, shooting related targets on the central column tower of a turntable for different scores to winning the tickets as the content of the game. Golden Saloon Holographic Projection Redemption Machine designs with a simulate coin pusher, energy up props, lucky bonus chance and collect 4 kinds of cards to win the jackpot prizes, game play is extremely attractive for any player. (2) aim the targets which the center of the pyramid turns the cylinder by the joystick, press the shooting button to shooting the target. 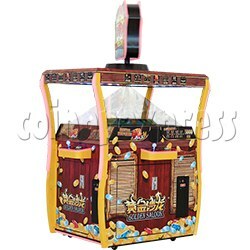 (3) shoot and destroy the target to win the corresponding tickets, and the shot coins fall on the platform to participate in the simulation of traditional coin pusher game. (4) after filling in the lucky draw slot, enter the lucky draw can draw a certain number of free shots. (5) make full use of the energy bar function, press the shooting button at the best time to get the highest damage. (6) there are three towers in the central column. Each tower has a different number of shooting targets. After the whole tower's targets are destroyed, the tower is destroyed and enter into the next tower. (7)after all three towers are destroyed, the super treasure box drops, the players shoot the treasure box, the treasure in the box falls on which player's twitter platform, it will belongs to this player. (8) in the game, player can collect 4 kinds of cards and collect 4 kinds of cards to win the grand prize.